As India's top court paved way for the nationwide release of controversial epic period drama film titled 'Padmavat', the police on Tuesday night arrested the Chittorgarh unit chief of Karni Sena which announced 'Jauhar' (self-immolation) by 1900 women if the film was screened in theaters. 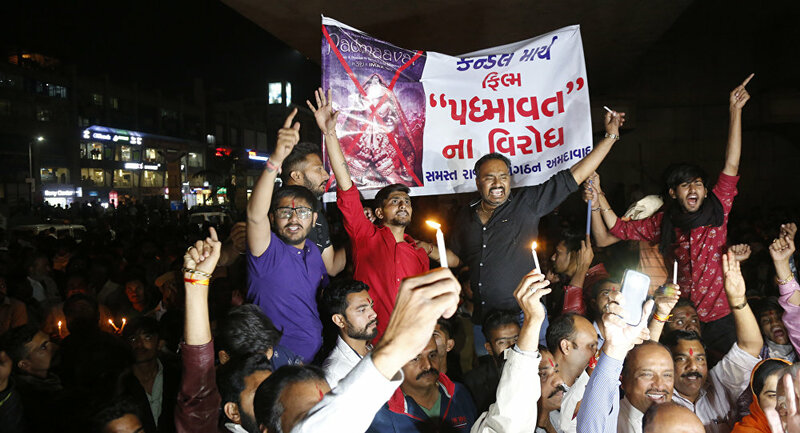 New Delhi (Sputnik) — Violent protests have erupted across India as the top court lifted a ban imposed by six states on the screening of the controversial film ‘Padmavat.' Activists of Karni Sena reportedly vandalized theaters in the eastern state of Gujarat and the northern state of Uttar Pradesh. The fringe outfit has said it will go to any lengths to ensure the film is not released in the country. Apart from the Karni Sena, another fringe outfit Hindu Sena has also issued a stern warning to theatre owners against screening the film in Delhi. "We have made a request through a letter to theatre owners for not screening the film. We have made 10 teams to stop the screening of the film in Delhi. Any theatre that goes against our warning will have to face consequences," Vishnu Gupta, Hindu Sena chief told Sputnik. In Meerut of Uttar Pradesh, protestors torched a large number of vehicles plying on the road. In Mathura, the railways had to reschedule the movement of trains as protestors threatened arson. Activists also blocked the Delhi-Mumbai national highway which is a major industrial corridor. In Gujarat, police have booked over 400 people violence. Forty-four persons were reportedly arrested on Tuesday night alone. Meanwhile, in Mumbai, police have reportedly rounded up scores of protestors from outside theatres. While there were no incidences of violence reported from the national capital Delhi, police said that they have made elaborate arrangement ahead of Thursday's release of the movie. "We have made adequate security arrangements. We will deploy police in the periphery of the cinema halls and our local officers are in regular touch with the theatre management across the city, we have also kept the reserve force ready. Apart from that, Delhi Police is in touch with Police of other states to gather intelligence. We are in constant touch with local contacts who are "eyes & ears" around cinema halls to gather information of any situation which may develop to disrupt the screening film and we will take immediate action on such information," Deepender Pathak, spokesperson, Delhi Police said. Several theatre owners in the states of Gujarat, Rajasthan, Jharkhand, and Madhya Pradesh have reportedly refused to screen the film out of fear of violence. Meanwhile, Karni Sena has called on the common people to abstain from going to the theatres. "We are adamant on our stand that this film should be banned. We want a nationwide ban. There should be a self-imposed curfew by the people," Lokendra Kalvi, Karni Sena chief said. Last week, the Supreme Court of India had paved way for the film's release after makers of Padmavat filed a plea seeking legal intervention after six states banned the film fearing a law and order situation. On Tuesday, the Supreme Court again made it clear that it would not reinstate the ban while rejecting a review plea by the state of Madhya Pradesh and Rajasthan. The Karni Sena has been spearheading the protests against the movie ever since the crew started shooting. The Hindu nationalist outfit claims the film is a blatant distortion of history as it allegedly projects a medieval Hindu queen of the Rajput clan as an object of desire of a Mughal ruler who invaded India.